In Ziggy Zig-zags the Light and Dark Fantastic, Vol. 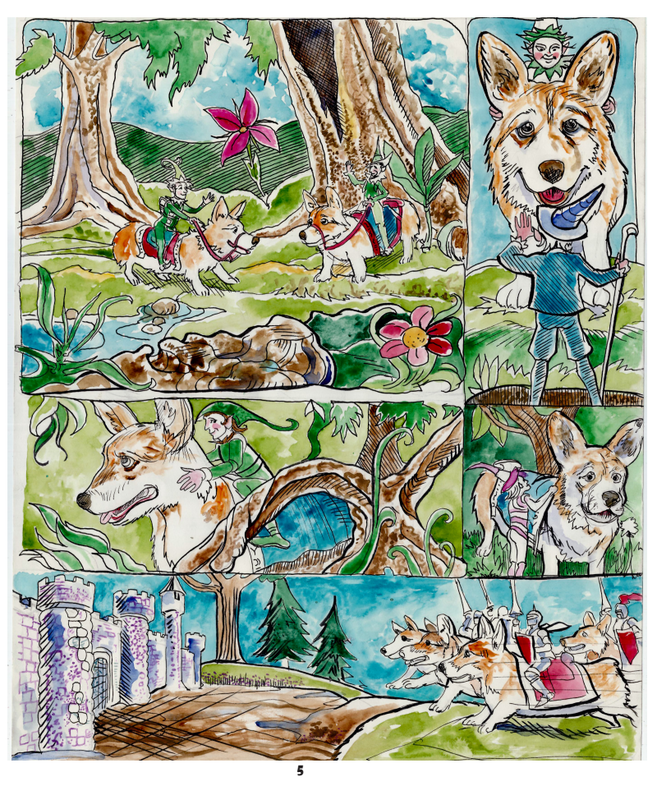 1, written by Ron Baxley, Jr., and illustrated by Vincent Myrand, a Welsh Corgi named Ziggy bravely navigates multiple familiar fantasy worlds (Neverland, Oz, and Wonderland), and Baxley likewise bravely and expertly navigates multiple conflicting narrative rule systems to create a prime example of the inevitable endpoint in the development of fantasy, what you might call the exponential pastiche. Pastiche became catch all term for a variety of techniques for intertextual referencing in analysis of postmodern fiction (e.g. Slaughterhouse Five is a pastiche of war fiction, sci fi, and confessional memoir), as if such a technique suddenly came into existence after WWII, but pastiche has been intrinsic to children’s narratives from the very beginning. Fairy tales passed down orally inevitably mixed up multiple narratives elements and styles with anachronistic present day cultural elements for maximum (exciting or terrifying) impact. As cultures increasingly intermixed, the pastiche mixed even more erratically. Witness, for example, how Norse and Greek myth mix freely in Medieval tales or how the pagan King Arthur is searching for the Christian Holy Grail. Then came the golden age of children’s book publication (heavily referenced throughout Ziggy) starting, arguably, with Alice’s Adventures in Wonderland in 1865 and spanning through the publication of the Peter Pan books and plays and L. Frank Baum’s massive oeuvre of Oz sequels and other similar fantasy books. This great golden age had such a significant impact that other great periods in children’s book publication seem to be echoes of this period. For example, Roald Dahl, Dr. Seuss, and Maurice Sendak published during what was conventionally identified as the postmodern period, but their pastiche was more in keeping with Wonderland and Oz than the current trends in novel writing. Another monument to the value of this period is the continuous publication of Oz sequels (several of which Baxley himself has written) after Baum’s death and the posthumous publication of his last Oz novel, Glinda of Oz, in 1920. What defines the post-Wonderland style of pastiche is placing the protagonist firmly in the present (Alice is unmistakbly a girl of the 1860s), and the fantastical elements he or she encounters are a mix of familiar elements from across the culture (Carroll, for example, did not create Tweedle Dee and Tweedle Dum, characters from orally passed down and apparently authorless nursery rhymes – let alone mythological creatures like gryphons or unicorns) mixed with original characters. This is done with a heavy sense of ironic humor that predates postmodernism by a century. The Alice books are able to manage the necessary chaos of this pastiche technique with charm and cleverness, but this chaos is hard to manage. The significant development of Peter and Wendy and The Wonderful Wizard of Oz is the inclusion of a definite plot thread, identifiable geography (including maps in many cases) that can’t be simply dismissed as dreams, and, most significantly, an internal rule system. The internal rule system is the most important feature of any fantasy series since the fantasy world has no necessary obligation to follow the rule system of our world, but audiences can view the fantasy as a success or failure by its consistent adherence to its internal rule system: an elf must act consistently like an elf in Middle Earth, and so on. 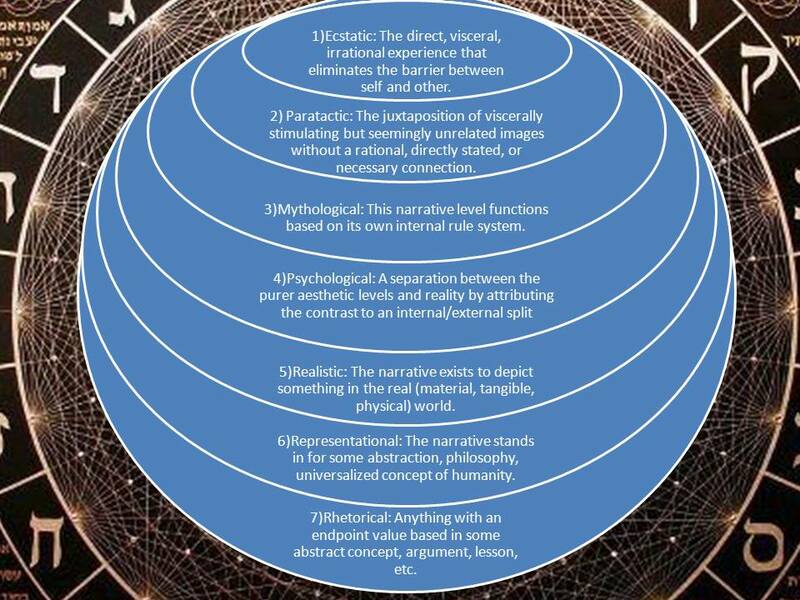 To take a preexisting and already heavily pastiched story world like Neverland or Oz is to tiptoe the minefield of conflicting narrative rule systems, and Baxley, as an experienced Oz chronicler, manages this feat expertly. 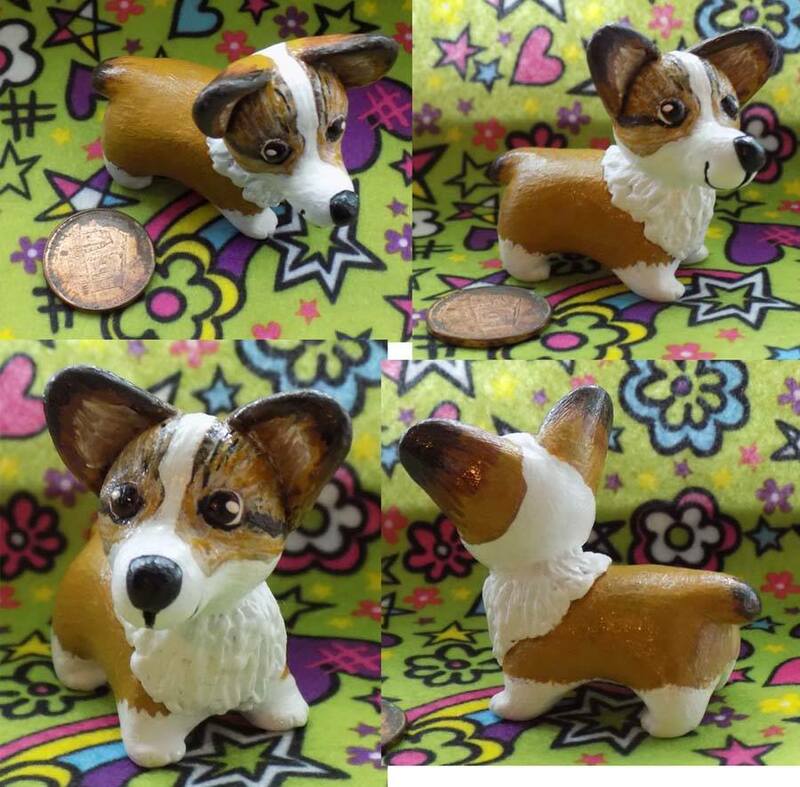 Ziggy Zig-zags the Light and Dark Fantastic starts by rooting Ziggy, the Corgi protagonist, in Welsh mythology where Corgis are treated as steeds for elves. The narrative moves quickly to Neverland where pixie dust and happy thoughts allow any sentient being to fly though animals are not endowed with speech. Baxley then introduces an original reinterpretation of a preexisting element: the crocodile has become essentially a demon lord of undead pirates. Baxley introduces several villains throughout the first volume (some familiar, some reinterpretations) that seem to be set up for pay off in later volumes because, in the episodic structure true to the source material, Ziggy moves on to another adventure instead of fully culminating this crocodile conflict. Ziggy next enters Oz where animals can speak, but flight is only possible with wings. Since the pixie dust retains its efficacy from the previous adventure, this is a direct overlay of Neverland and Oz rule systems. In this adventure, Baxley further integrates superhero tropes as Ziggy accompanies a flying monkey in his conflict with an evil mad scientist right out of old Captain America comics. Baxley doesn’t take the easy way out by segregating tropes and rule systems; he piles it all on top of each other. It’s remarkable that this pastiche-of-pastiche actually works. Part of its success comes from the charm of Ziggy himself who must overcome his anxiety (framed anachronistically in a contemporary manner just as Alice’s own concerns are anachronistically Victorian) to defeat overwhelming odds and eventually face all the accumulating villains, but that’s the key to managing the superficial chaos of cultural mix-and-match: a charming character like Alice or Wendy or Dorothy or Ziggy can guide us delightfully through any scenario. Let me not forget to give credit to the illustrations of Vincent Myrand who is more reminiscent of Quinten Blake’s illustrations of Roald Dahl stories than John Tenniel’s clean-lined, relatively realistic Alice illustrations or or John R. Neill’s similar illustrations of the Oz books. It may have most in common with W. W. Denslow’s original Oz illustrations: the playful lines, the more childlike sense of proportion, the vibrant colors. However, the squiggly quality of the lines and the loose color fill is so reminiscent of Blake’s technique, it makes me wonder if Ziggy will soon enter one of Dahl’s worlds in future volumes. Together, Baxley and Myrand give plenty to look forward to in future volumes. Ziggy Zig-zags the Light and Dark Fantastic, Volume 1 is available in the comics section/front of Book Exchange of Ft. Gordon Blvd. in Augusta, Ga., Top Dog Pawn (and comics) on Washington Rd. in Augusta, Ga., Silver City Comics in Cayce, S.C., Scratch N Spin in W. Columbia, S.C., Punk Monkey Comics in Forest Acres in Columbia, S.C., Planet Comics in Anderson, S.C., the Little Red Barn art shop on Hwy. 278 in Barnwell, S.C., and The Caroline Collection antiques in Denmark, S.C. It is also available outside the region at the All Things Oz Museum gift shop in Chittenango, New York and Comics ‘N More in Easthampton, Massachusetts. It may soon be available in Bodacious Books and Baubles in East Longmeadow, Massachusetts and The Book Tavern on Broad St. in Augusta. Ron has a contest going on where if people find a custom mini-figure of Ziggy from Skittychu Clay and Art in Augusta at one of these places in S.C. and Augusta above and agree to have their photo taken with the figure and his graphic novel and have their likeness used via social media, they will be able to keep the mini-figure absolutely free. Oz, fantasy, and science fiction children’s and young adult author Ron Baxley, Jr., a former educator of approximately 20 years and published author of 25 years, has most recently had an Oz collection, The Oz Omnibus of Talking City Tales and an Oz/Wonderland combined co-written with James C. Wallace II, Of Cabbages, Kings, Queens, Flying Pigs, and Dismal Things, published by Maple Creek Press of Mysteria Filmworks in Cincinnati Ohio (http://www.maplecreekpress.com ) and has independently published a volume of a fantasy, Corgi graphic novel with some Oz content, Ziggy Zig-zags the Light and Dark Fantastic, with art by Maine artist Vincent Myrand and layout and lettering/bubbles by Ali Tavakoly (email rbaxley37@gmail.com for information on obtaining Volume 1 of this independent project or look at the list of stores in which it is available). Ron Baxley, Jr. has been formally invited as a guest author in Authors and Artists Alley in Oz-Stravaganza, a festival in Chittenango, New York in the birthplace of L. Frank Baum, for six years, has been formally invited as a special guest author or guest author at Oz festivals and science fiction cons since 2010, and was recently awarded the honor of a lifetime membership by the International L. Frank Baum and All Things Oz Foundation in Chittenango, New York in June for his lifetime achievements in the world of Oz. For more information, go to http://rbaxley37.wix.com/ronbaxleyjrofoz, search for the Ziggy Zig-Zags the Light and Dark Fantastic group Facebook page, seek Oz fan Sera Alexia Starr’s Facebook page, Ron Baxley Jr. An Official Author’s Group Chat With Book Updates (https://www.facebook.com/groups/196187527438597/ ), and/or befriend Ron on Facebook.